B. Support the rules and special-shaped handle. 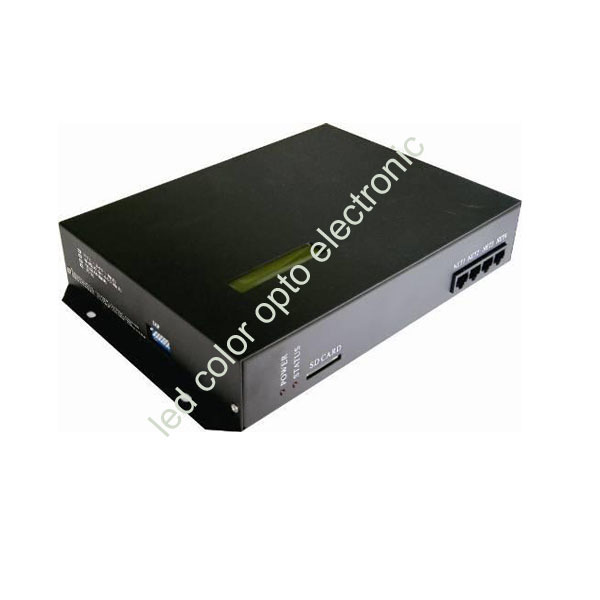 C. 8 ports output，one port can support 512-1024 lamp pixels. the contents of the line control program stored in the SD card. E. Compatible with single line or double line chips. Note: the T-300 K controller offline control, each machine controller must put a SD card. support the new version of the controller, the new version of the controller has been printed the Chinese sign. play speed can reach 30 frames/s. Double-line IC or single-line IC with low speed , one interface controls 512 lamps the play speed can reach 30 frames/s. NOTE：According to TTL signal output， Ground of the controller must be connected to the lamp ground. LED digital tube,、LED point light source、the exterior light and a module、 pixel screen (dazzle colour screens)、 high power DMX lighting. NOTE: T-300K Support online download the effect-file to SD card.